Walking off the stage at my high school graduation, I remember thinking that the transition into my “next chapter” would consist entirely of the extended weekend of freshman orientation at Linfield College, moving all of my stuff into my dorm room, meeting my new roommates, and attending my first day of classes. Period. Approximately 5 days in total. I also remember thinking that I was 1 for 4 of big life transitions – first there’s high school graduation. Check. In four years I would walk off the stage at my college graduation. Check. Shortly after that, I anticipated I would check off “new job that I love and will stay in for a long time”. And sometime after that, I would (finally) check off the “real adult”, which at the time was some vague combination of marriage, maybe. Kids, perhaps. A house. A car that worked. My own insurance bill. I’m leaving Inflexion soon to take a new job, in a new town, as a high school counselor. I’m both thrilled and sad at the same time. Like most of my previous major transitions, this one snuck up on me, but I’m always excited for new opportunities to learn and grow. This time, however, I find myself reflecting and preparing differently. One of the things I most enjoyed about my time at Inflexion is that we don’t just talk about getting students across their high school graduation stage, (check). Instead, we focus on creating a holistic definition of readiness that reflects the skills students need to successfully navigate life after high school (not just check the boxes). We work with schools and districts to ensure that every student walks across the stage at graduation truly ready for college, career, and all of life’s transitions. So, I’ve been thinking, as I move into my new role as an educator, how can I leverage what I learned at Inflexion to better prepare my future students for success? 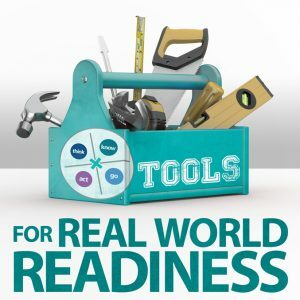 To me, using the Four Keys to guide a holistic definition of readiness is much like helping students put together their own toolbox of skills rather than give them a blueprint or rigid definition of “success”. What if, as educators, our job was to reflect on our own life experiences, identify those tools that have been most valuable to us – our “go-tos” – and figure out how to pass those on to our students so they can pursue any and all things that align with their passions and aspirations? Further, which tools would I personally want to pass on? What skills have been most important for me since crossing the stage at my own high school graduation? Tool #1: Know how to problem solve, anything, always. I think this skill gets a bad reputation, and I’ll agree, it’s a bit cliche. What does it actually mean to have “problem solving skills”? Well, for me, it has been essential – and it looks like this: When I encounter a challenge (read: roadblock, setback, dilemma, pickle) for which I do not immediately know the solution, I keep asking questions until I find one I know the answer to. Then I do that over and over until I’ve gathered enough information to create a game plan. I learned both that I had become good at this skill and that it was a useful one the day my car broke down, on highway 26, at approximately 5:12pm, in the middle of rush hour traffic. Q: Why did my car suddenly stop? A: I don’t know. Q: Was it the battery? A: I don’t know, ask again. Q: Or is my oil low? A: I really don’t know. Ask a non-mechanic question. Q: Ok, can I make it home first and then figure out what’s wrong? A: Probably not, since it won’t start. Q: Ok, so what do I need? A: To get home at some point, and then fix your car. Q: Right, and what did I do last time this happened? A: You called AAA and had it towed to the mechanic. You get the idea. Problem solving isn’t having all the solutions at your fingertips, it’s asking questions until you find answers that move you toward a solution. This one was probably the trickiest for me to grasp, and I’m positive I’m not 100% there yet. When I graduated from high school, I thought knowing myself meant knowing what I want to study in college and what career I want to pursue. I didn’t realize that knowing myself– being self aware– also meant knowing my strengths, my weaknesses, whether I was introverted or extroverted, how I deal with stress, how I like to celebrate, what I value most in life and not just in a job. Because all of these layers contribute (or should contribute) to all of my life decisions, at least if I hope to enjoy the result. Nobody told me that there wasn’t a “right” decision to life after high school– that it wasn’t a quest for the single, best, most efficient route. I’m learning there is no universal definition of success. I have to define that for myself, in the context of who I am, what I care about, and what I’m good at. I’m learning there is no universal definition of success. I have to define that for myself, in the context of who I am, what I care about, and what I’m good at. Four years after high school and six changes to my college major later, I graduated with two that I kinda liked. Also, I know I’m a safe driver, despite what the previous and following examples seem to suggest. I learned this one by getting hit by a car. I actually learned this sometime prior, I’m sure, but I really got to practice it as a result of that moment. I had checked off one of the “real adult” boxes – have your own insurance –but to be totally honest, I had no idea how it worked. Turns out, insurance can be really complicated, and most people who work in insurance forget that. Self-advocacy, for me, means asking questions until I understand the answer– not just until someone answers them. There are a lot of complex systems in the world after high school, many of which are unfamiliar to me even now. As a lifelong learner, it’s my responsibility to seek out the information I need and ask that it be explained in a way that I understand it. Other people don’t know what I need until I tell them – this is advocating for yourself. This might not actually be a “skill” per se – but it’s by far my favorite. For me, owning my space means stepping up to the counter, picking up the phone, and walking into interviews with confidence. Because I know my abilities, I know my strengths, I know who I am and what success means for me. And anything that I might lack, I’m confident I can figure out with my problem solving and self-advocacy skills. Is this next life transition going to be executed flawlessly? Absolutely not. But that doesn’t mean I’m not ready. I am equipped to get through any challenge life may give me, even though sometimes that might mean discovering I need to add new tools. That’s what’s so great about the Four Keys and a holistic definition of readiness – it’s not about putting students through a “one-size fits all” assembly line. It’s about helping them build their toolbox, so they can take on whatever life throws at them. Question for you, reader: looking back on your life, which skills do you find yourself falling back on time and time again? And if there are any young ones in your life, how can you pass your MVTs (most valuable tools) off to them?